Here's a mystery that I hope someone can solve. The animator draft lists Shafer, but there was nobody at Disney that I'm aware of whose last name was spelled that way. There was Armin Schafer and Milt Schaffer, both of whom animated at Disney in the 1930's, but Albert Becattini doesn't list either of them animating into the 1940's. Did either of them work on this cartoon, or is it somebody else? I'll write more about this film in a future entry. I'm thinking it probably is Milt Schaffer. A 'Milt' is credited on the animators' draft of "Fish Fry" (at Lantz, he is credited as co-writer with Ben Hardaway on the same short), so he could animate! Wow, have I ever been under the wrong assumption all this time! I always believed that Freddy Moore and Ward Kimball masterminded this cartoon, only to find out now that neither of them worked on it at all. Seems the scenes I had assumed were Freddy's were mostly done by Marvin Woodward and that terrific, wacky little dance I'd attributed to Ward was done by Ken Muse. I'm actually rather ashamed to confess that many of the animators credited on this cartoon I've not heard of before, and Ken Muse I've always associated more with his work at MGM, not Disney. Again, thank you Mark and Hans for bringing out all of this great info. Peter, I'm glad we finally get to meet the animators. I wish the studio would officially release this info some day - I see no political reason not to - only that it wouldn't make heaps of money. By the way, who is Tim Cohea? Tim is an animation historian/fan who hangs out a lot at the Termite Terrace Trading Post. Armin Schafer animated on The Country Cousin according to Albert Becattini. It's quite possible that it's Milt Schaffer, but having been burned on the Roy/Don Williams identification, I prefer to leave it ambiguous unless somebody can supply some other evidence. Hans, is there a draft from the same time period that includes a Schaf(f)er who is spelled differently so that we'd have a clue? "I always believed that Freddy Moore and Ward Kimball masterminded this cartoon, only to find out now that neither of them worked on it at all." Maybe they acted as animation supervisors without animating any scenes on their own but still making their mark on it? I"ve got a question about this cartoon: I've got a production drawing from "Mickey's Surprise Party" that could absolutely be from shot 18 of "Mickey's Birthday Party" except that Mickey is wearing his two-button knickers. I seem to remember reading somewhere that some of the animation in "Surprise" was recycled for "Birthday." What then does this mean in regards to the animator identification here? A quick look at my drafts show no "Schafer", but "Schaffer" is credited for four scenes in Society Dog Show (the first scene of Mickey inside the building and the following three scenes), roughly around the same time. There are often spelling errors - like Frank Onaitis spelled Onatais in Nifty Nineties, remember? Galen, there is no released cartoon called Mickey's Surprise Party. That may have been a working title for the 1931 cartoon The Birthday Party. 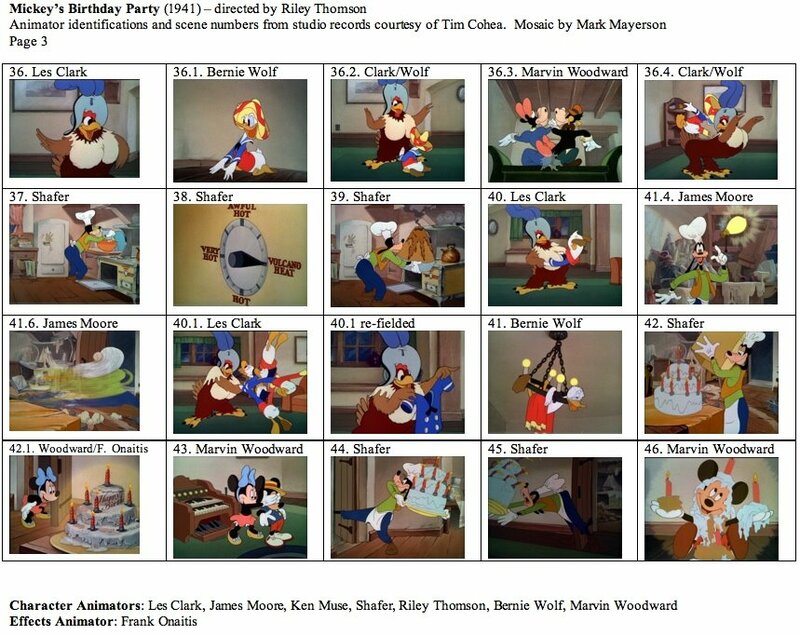 Mickey's Birthday Party is a very loose remake, re-using the situation and a few gags, but there is no animation that is lifted from the earlier cartoon. The IMDb lists it as from 1939. It was produced for Nabisco for the 1939 World's Fair. It's also listed in John Grant's "Encyclopedia of Walt Disney's Animated Characters". And I'll be glad to send you a jpeg of my drawing (which is rougher than that one) if you wish. I got it from Gallery Lainsberg, a very reputable (now defunct) source. It's got a pose very clearly identical to one in your shot 18. 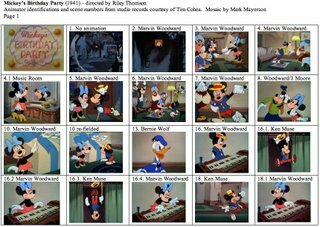 Sorry, that link doesn't seem to work directly, but do a Google image search for "Mickey's Surprise Party" and you'll find it. Galen, you're right and I'm wrong about Mickey's Surprise Party. I was checking the list of theatrical Mickey cartoons and forgot about Mickey's Surprise Party which was done for Nabisco for the 1939 World's Fair. The scene of Minnie putting on lipstick seems to be the only animation that was lifted from the Nabisco film for Mickey's Birthday Party. Mickey has a hat and cane, but he does no dancing. Is your drawing an animation drawing or a storyboard drawing? If it's a board drawing, maybe there was material developed for the Nabisco film that wasn't used, and then it was revived for Mickey's Birthday Party. 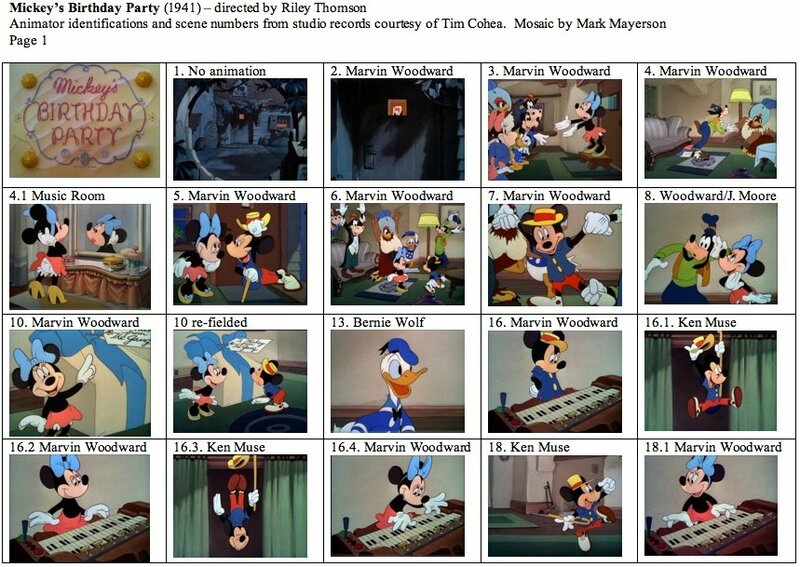 Now at least I know why the Music Room is credited with scene 4.1, where Minnie puts on the lipstick. There was no new animation done for it as it was lifted from the Nabisco film. What does "re-fielded" refer to? Definitely an animation drawing on animation paper. I had it professionally framed years ago and don't really want to open it up, but I remember it is numbered. Apparently "Mickey's Surprise Party" is on DVD on "Mickey Mouse in Living Color," which I don't have. Does he really not do the dance? Then what's up with this drawing? Galen, your drawing is from Mickey's Birthday Party, not Mickey's Surprise Party. I checked Surprise Party again and there's nothing remotely like your drawing. The good news is that you have a Ken Muse rough. Congratulations! I'm guessing that after Muse animated the scene, somebody decided to change Mickey's wardrobe and an assistant animator was given the job during the clean-up phase. Well, I was all excited about having a Freddy Moore, but I guess a Ken Muse is pretty good, too! Thanks for checking on this, Mark. I guess someone at Gallery Lainzberg saw the hat, cane, and knickers, and so misattributed my drawing to "Surprise." Hans, thanks for checking on other drafts for Schaffer mentions. Unfortunately, the closest cartoon in your list of other Schaffer credits is 1939. I'm willing to admit that it's probably Milt Schaffer here as we know that he handled Goofy in other cartoons, but there's still some room for doubt. A bit more on Milt Schaffer: born Nov. 11th, 1917, died March 12th, 1993 (Encino, CA). Which means he was 19 for most of 1937, working on Donald's Ostrich. From IMDB: worked as writer & director for Lantz from 1942 (left during strike? ), back at Disney's 1946 as writer. More Lantz from 1956. Milt Schaffer's job description from early 1937 till he was fired in Fall '41 was "story crew". Soooo any animating by him (like in the Sept. 1938 release "The Brave Little Tailor" or 1939's "Society Dog Show") can be seen as irregular and or merciful. And Disney has down that the REAL spelling of Armin Shafer's name was indeed SHAFER... Additionally, he was an assistant animator from AT LEAST Jan. 1938 until he was canned in Fall 1941. As such the REASON why we don't see his name turning up as animator except on a couple of shorts (including this one) is because he was just an assistant... 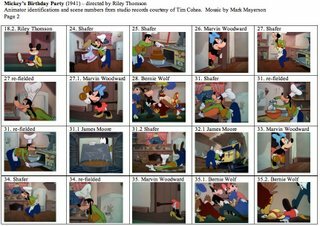 But that Riley graciously gave him some actual scenes to animate in "Mickey's Birthday Party", shortly before Shafer was fired. Armin shows as never being employed at Walt's after that, which is why he's not in the 1946 studio phone directory. Later on he turned up at John Sutherland's as a full animator. Shafer and Schaffer were fired from Disney the same day!!! Lastly, Milt Schaffer was only a director (with the great Emery Hawkins) on one cartoon. His usual Lantz job was drawing the storyboard for Ben Hardaway, though they were both of course listed side-by-side as storymen. Hope your vacation is great! Very, very interesting, Tim! Thanks for the info! And it seems that Armin Schafer was there already earlier, for Alberto Bacattini refers to him thus: "Animator: DISNEY 36 (Silly Symphony 36 [The Country Cousin])." 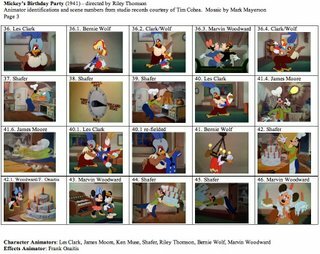 It also explains why Alberto only credits Milt Schaffer for "Animator: DISNEY 34-37 (Donald Duck 37 [Modern Inventions, Donald's Ostrich], Mickey Mouse 38 [The Brave Little Tailor])." Glad to have helped! 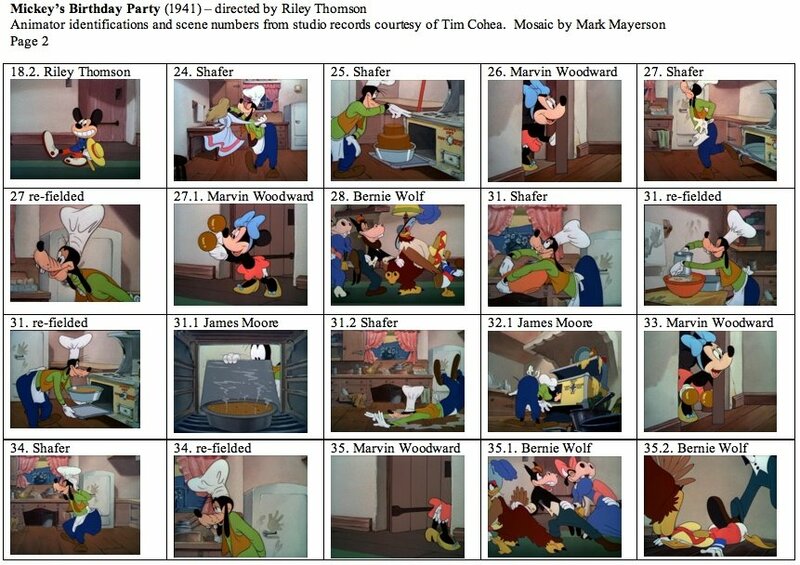 And yeah, according to Disney records, Armin Shafer did indeed join Walt's in 1936, June 1 to be more exact. There's two ways to resolve that... One is that there is an error somewhere, either in his working on "Country Cousin" or in his date of employment... I HAVE found that in SOME instances Disney had evidently thrown away former-employee's personell cards when they had quit in the mid-Thirties. And then when they returned a new card was created... This I think would explain things. I'd be willing to bet it was Milt Schaffer. He was my uncle and I know he specialized in Goofy. Since all the "Shafer" frames are of Goofy, I think it's a safe assumption. Pete, I was under that same misapprehension, maybe because Ward used the animation of Mickey blowing on his cane (like a party favor) on the end credits of his "Mouse Factory" TV show. But please note, the wacky part of the dance, where Mickey makes faces and stick out his tongue (shot 18.2), is animated by director Riley Thomson. Ken Muse only did shot 18, which is the beginning of the dance. Cartoonist's Work Banned By Prison!